Watch my Spring Statement Jewellery video here! I have always been a huge fan of statement jewellery but sometimes it's hard to find a good quality brand that fits your budget. Designer or high-end pieces tend to be quite pricey, whereas the cheaper low-end highstreet stuff can often look junky or tacky. Talullah Tu is a London based costume jewellery brand that I feel ticks all the right boxes. The quality is always superb, the materials are lightweight and don't weigh you down, the packaging is adorable and the pieces speak for themselves. Prices: The price-range for Talullah Tu jewellery is usually about £10-£20 which I think is appropriate given the high quality with which each item is made and attention to detail in every piece. It's a more affordable alternative to many high-end designer statement accessories on the market. Shipping: Shipping costs are also very reasonable. If you live in the UK, you only pay £2.95 whereas for the rest of Europe shipping is £5.95. If you live outside of Europe, it's £8.95. Packaging: Everything from Talullah Tu comes carefully and beautifully packaged. I received six items total and each one was individually wrapped in a plastic ziplock bag with bubble-wrap or some kind of foamy paper. Everything came in perfect condition, and were put into adorable pink paper bags which were then wrapped up with tissue paper in a cardboard box for shipping. Pros: These are probably my favourite earrings of the bunch, as they're super pretty statement pieces which are perfect for summer. 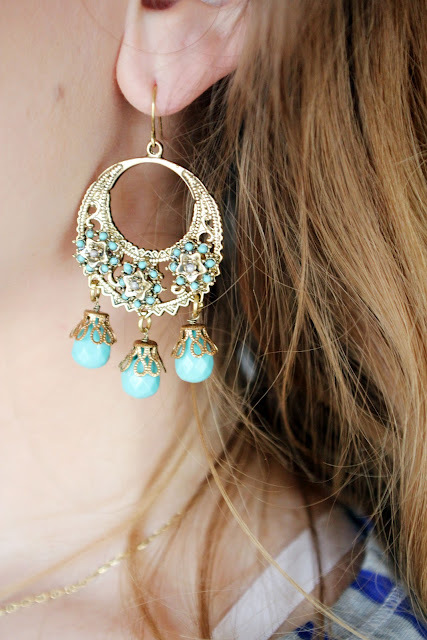 They have a boho chic feel to them and are very on-trend for Spring/Summer in terms of the turquoise. I feel like these would look great with coral, browns, golds & blues. Cons: These earrings do not come with a back to them and if worn without they will probably fall off! So make sure to have some clear rubber backs handy to use with them. Pros: These are very pretty and elegant long drop earrings which would look great in the daytime or evening, particularly with an updo! Pastels are always a big trend for Spring/Summer and these would work well with peaches & nudes. Cons: Again, these don't come with backs. Pros: Again these are gorgeous elegant drop style earrings which make a statement on any look. 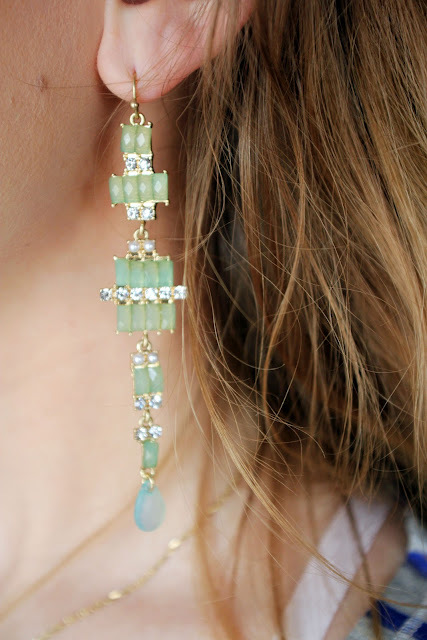 If you're a big fan of the mint trend this spring, you will love these! They would look so pretty with any shade of green, pastels or even black. 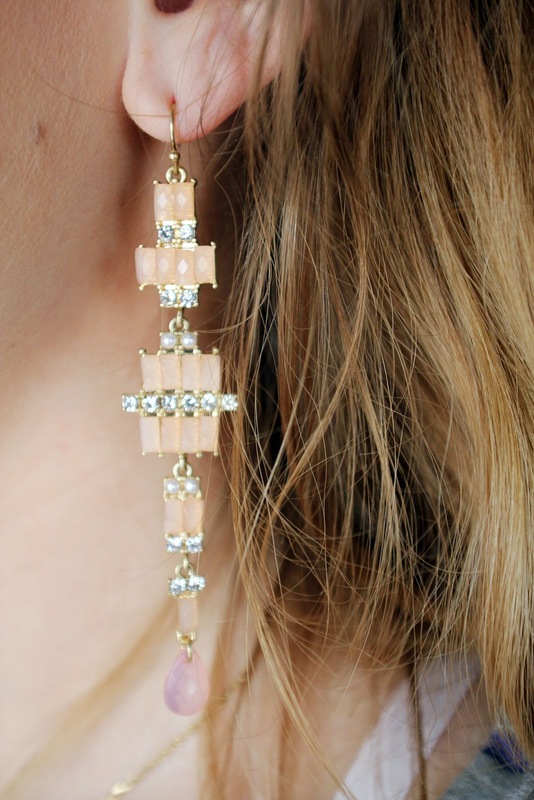 Pros: If you are one of those people who doesn't like dangly earrings and favours studs, yet you still want to make a statement with your look these would be perfect! I think these are my second favourite pair as they're so pretty and chic. I wore mine with a simple striped tee and they completely dressed it up. I also love how they don't weigh down my ears as some big stud earrings do. Cons: This isn't so much of a con, but the earrings come with clear rubber backs which is different to what I'm used to. (I generally prefer this style worn with dangly earrings.) However I've worn these totally comfortably for two days now and the rubber backs work just fine. 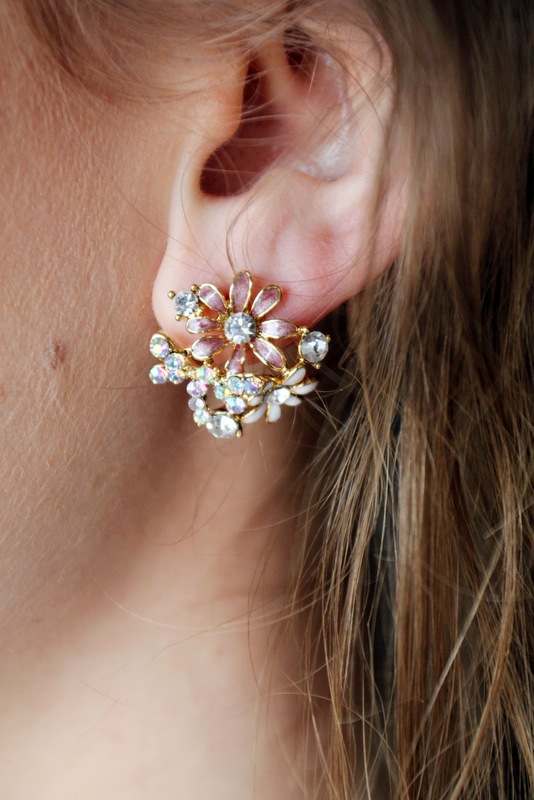 Pros: These are the perfect spring accessories, especially if you want to incorporate the floral trend into your jewellery! 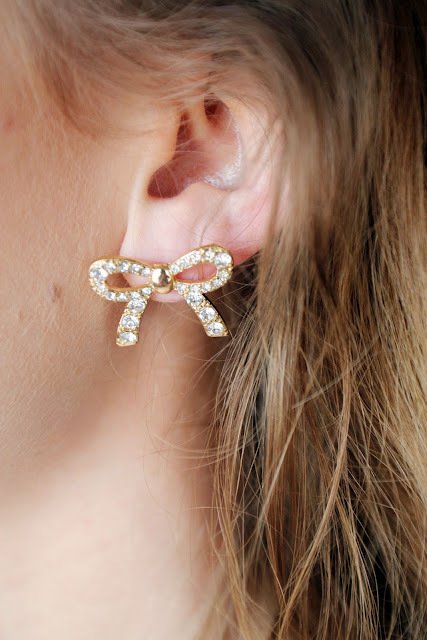 Like the bows, these are good size statement studs and if you don't like dangly earrings these would work for you. Again they are not heavy at all and don't pull on my ear lobes! Also, these came with my favourite backs for studs -- the regular gold ones. Pros: This is the matching piece to go with the earrings above. I'm not usually much of a hair accessories kind of girl but lately I've been really loving them and this is no exception! I wore this on Easter Sunday and got a ton of compliments on it. It's the perfect elegant & pretty hairband which could be worn with hair up or down. 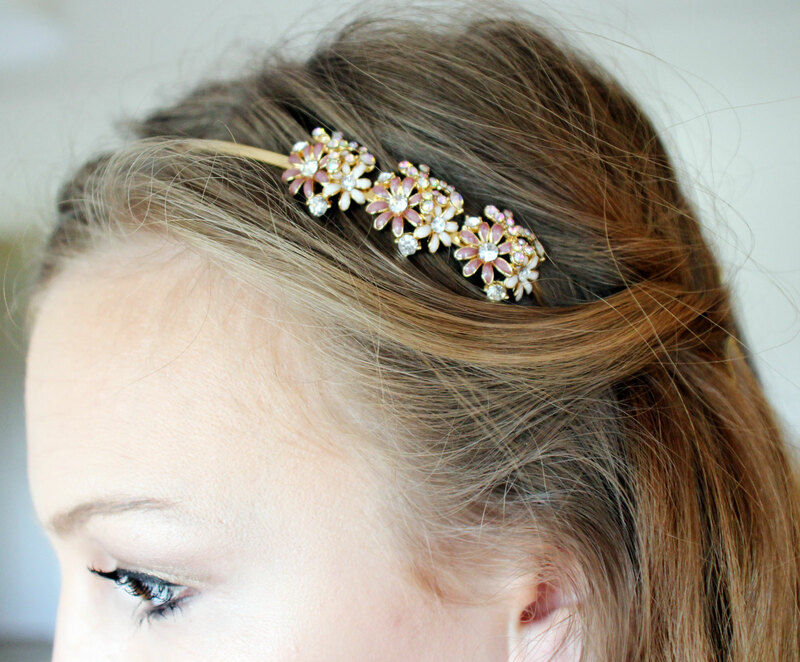 I think this would be so cute on a flowergirl or even a bridesmaid, as it's not too "in-your-face" and adds just the right amount of sparkle to your hair. Cons: Like all metal hairbands, this does hurt after a couple of hours. Having said that, I did wear it for an entire day and it really only started to give me a headache later that evening. After I adjusted the hairband slightly, it wasn't uncomfortable anymore. Let me know what you think of these pieces! Are you a fan of spring statement jewellery? All of these items are available from the Talullah Tu website.